The family of the 96th Hillsborough victim have said they are "hugely disappointed" nobody will be prosecuted over his death - but that "justice has been achieved" following the inquests. 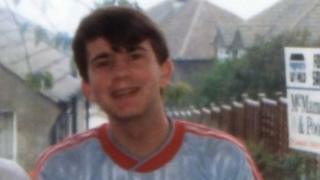 Tony Bland, then 18, was left severely brain damaged after the 1989 tragedy and died nearly four years later. Former Ch Supt David Duckenfield faces 95 charges of manslaughter by gross negligence over the other deaths. He cannot be charged over Mr Bland's death as too much time had passed. In a statement, his family said: "Whilst we are hugely disappointed with the exclusion of Tony from the manslaughter charge against [match commander] David Duckenfield by the CPS, our relief for the families of the other 95 men, women and children outweigh our personal frustrations. "Justice has been achieved following the inquests [in April 2016], when the jury returned the verdict of all 96 victims being unlawfully killed at Hillsborough, and nothing will ever change that. "We will continue to support the other families on the journey for accountability." Mr Bland, from Keighley, West Yorkshire was left in a persistent vegetative state after a crush on the Leppings Lane terrace at Sheffield Wednesday's stadium during the FA Cup semi-final between Liverpool and Nottingham Forest on 15 April 1989. He died aged 22 after his life-supporting treatment was removed following a legal battle.